The Vikings, err Eagles, will pick 14th in the 2017 NFL Draft. 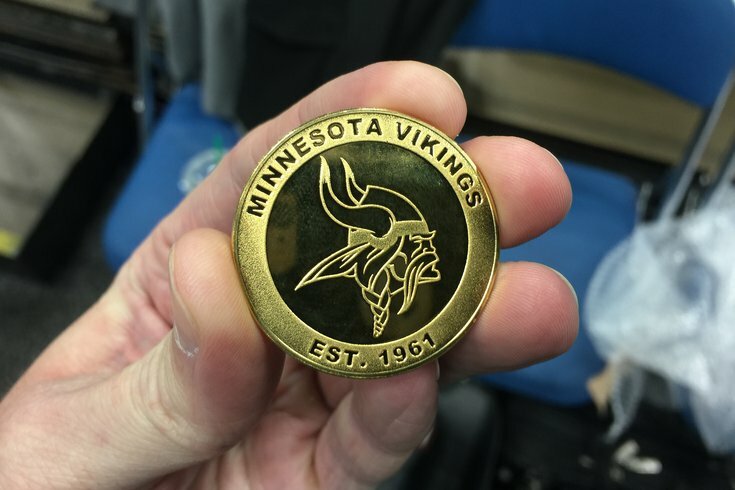 INDIANAPOLIS – On Friday at the NFL Combine, a coin toss was held between the Indianapolis Colts and (technically) the Minnesota Vikings, to determine which team will be the placeholder for the 14th and 15th overall picks. The Eagles came out as the big winners. The Eagles' first-round pick comes courtesy of the Minnesota Vikings, who traded it to the Birds for Sam Bradford just before the start of the regular season after starting quarterback Teddy Bridgewater was lost for the year with a gruesome leg injury. The Vikings had the same record as the Indianapolis Colts at 8-8 to close the regular season, and both teams finished with a strength of schedule of 0.492. The next tie-breaker for teams in opposite conferences is, of course, a coin toss. The coin toss was held at the Indianapolis Convention Center, literally on the stage where players are tested on the bench press. The coin itself was not heads or tails. Rather, it had the Colts' logo on one side, and the Vikings' logo on the other side. It landed Vikings side up, which means that the Eagles will pick 14th, while the Colts will pick 15th. 4 (139) Acquired from Browns as part of deal to acquire 2016 No. 2 overall pick.